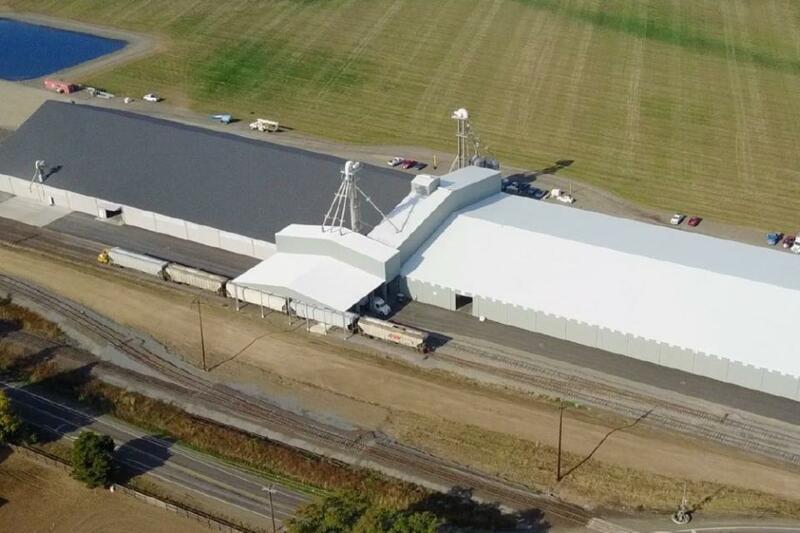 Aerial photo of Marion Ag Service in Aurora, OR. Stueve Construction designed, engineered, and constructed a “one of a kind” world-class bulk-fertilizer facility to meet Marion Ag Service’s unique needs. “The Willamette Valley of Western Oregon has a very diverse cropping system. Over 150 different fertilizers and amendments needed to be housed for ag and specialty crop blending and packaging. Stueve’s in-house staff met our expectations by providing 28,750 tons of storage in 50 bulk bins,” General Manager Tom Wimmer says. The 50 bulk bins are positioned in the center of the storage facility to allow the flexibility to have a blending and load-out system on each side of the facility to reduce customer wait time. “Stueve’s in-house engineering permitted and erected the building in a professional and timely manner, working side by side with other equipment providers. Western Oregon’s rainy winters made the project challenging for the construction team, but the quality of the structure was not compromised and took less than a year for us to commence operations. Stueve’s team is very accessible and continues to provide quality customer support beyond our first year of operation. Stueve, along with our other equipment and software partners, has constructed a facility we are very proud of!” Wimmer says. “We originally started our business plan in 2012, and our goal for Town & Country was to be a viable resource of dry fertilizer for our patrons long into the future,” General Manager Wes Burley says. “We needed a facility that could hold a season’s volume of fertilizer to ensure that we had the product when we needed it. When determining what size facility to build, we looked at what was being done in areas around us, and it was apparent that to remain competitive into the future, we needed the option of rail logistics pricing,” Burley says. “We had met with multiple entities that specialized in the construction of mega-plant facilities and toured various sites to view the finished buildings. We leaned toward the Stueve facilities originally, based on the design and comments we heard from individuals running the newly constructed sites. Once we met with the Stueve personnel to discuss the project, we were very impressed at how they handled the process. We were shown the options we had available to us and met with the various machinery and automation vendors. The overall process from start to finish was very professional, and we are very pleased with the final results,” Burley says.